FARNBOROUGH, UK — The U.S. Air Force wants more companies to work on its artificial intelligence and software projects. It’s possible that the study, which looked only at unclassified contracts, missed some work on secret projects. Still, the recent employee protest that led Google to end its work with the Air Force’s Project Maven makes it clear the Pentagon still faces headwinds in its quest to harness the best of America’s private tech sector. While Roper acknowledged that the Air Force needs to do better, he said the service's Kessel Run Experimentation Lab has been successfully attracting software developers. “The companies driving AI are a different breed of companies than those that drive evolution in hardware — especially companies that drove hardware that have gotten us to today’s military,” he said. “The paces are faster, the turnovers are quicker. Software is done in months cycles, not years cycles. 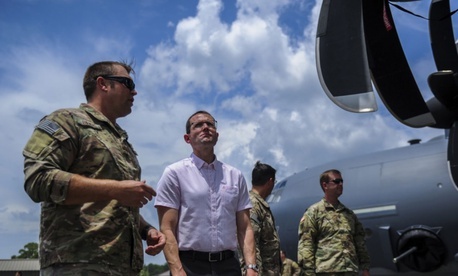 The Air Force, Roper said, is looking to expand the use of its AFWERX centers that look to connect small tech forms and academia to the military. “We’re going to need people that are working with us that are software people that are working, tweaking algorithms with the users that use them,” Roper said. Like many initiatives at the Pentagon these days, speed is a key component. “We have to do that much faster,” he said. “In a business, especially small companies that are looking for venture capitalist dollars, we have to move faster than we can move even on our best days in the government. We’re looking for ways that we can do awards [in] weeks instead of months. “If we end up making ourselves so slow and sporadic that we can’t work with this vibrant, churning, current of innovation in industry, then we could lose out to companies or nations that can,” Roper said.